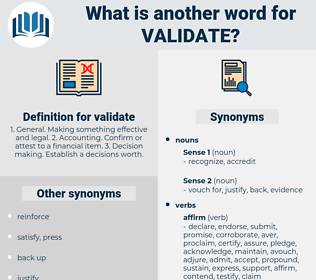 What is another word for validate? 1. General. Making something effective and legal. 2. Accounting. Confirm or attest to a financial item. 3. Decision making. Establish a decisions worth. 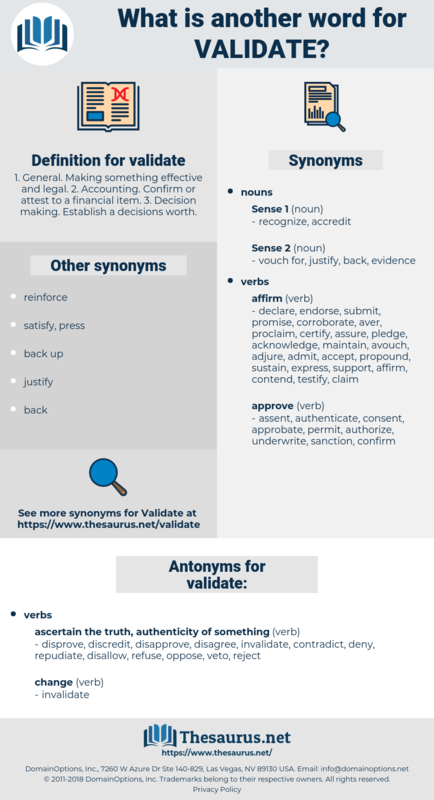 substantiate, certify, endorse, authenticate, approve, evaluate, ascertain, demonstrate, reaffirm, corroborate, consolidate, justify, attest, assess, prove, accept, reiterate, identify, assert, determine, sanction, appreciate, appraise, recognize, testify, authorise. disprove, discredit, disapprove, disagree, invalidate, contradict, deny, repudiate, disallow, refuse, oppose, veto, reject. challenge, presume, conjecture, contest, quash, avoid, gainsay, vitiate, guess, nullify, disavow, allege, question, surmise, disclaim, object, annul, refute, assume, rebut, suspect, dispute, void. cosign, ratify, probate, sign, co-sign. sustain, affirm, support, substantiate, corroborate, confirm.